The stunning view of the rolling hills of Panzano from the vineyards at Le Cinciole. Click on the photo for the full panorama. I love wine. I love Tuscany. However, I am terrible at choosing which wineries to go to. I want to visit all of them and return to those I’ve been to and love. So rather than take up the arduous task of figuring out where to go [and the headache that is getting in and out of Florence in a car] I enlisted the assistance of Coral Sisk at Curious Appetite. I gave Coral a list of my favourite winery characteristics, such as family owned, sustainable, as natural as possible, expressive wines. She curated a day in the rolling, dramatic yet serene hills of Chianti Classico that was truly an amazing experience. [So amazing, she is putting together my next adventure!] 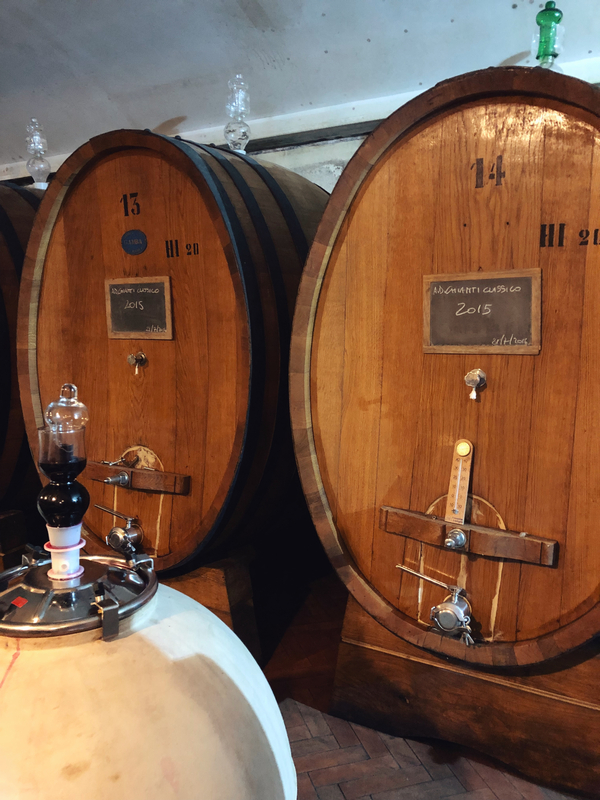 Head over to Curious Appetite to see her bespoke food and wine tours both in and outside of Florence. Le Cinciole is located in the heart of Chianti Classico, outside of the picturesque village of Panzano. Named after the property’s ancient Etruscan-Roman name, which designated the immediate area as “the lands of Quintius,” the estate was purchased in 1991 by Milan natives Luca and Valeria Orsini. 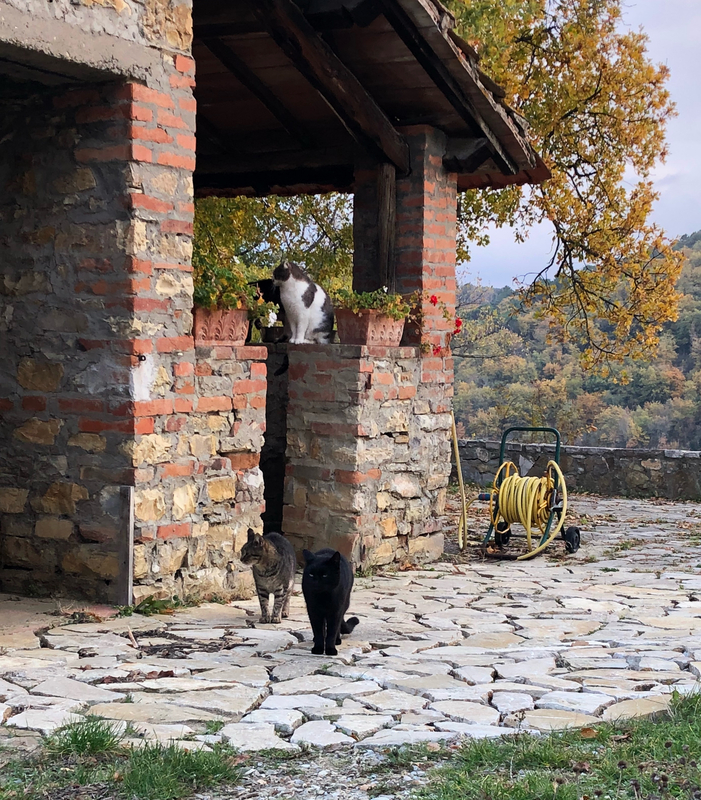 Leaving their city life and careers behind, they radically changed directions and dedicated themselves to revitalizing the land and vines, and rebuilding the cellar, simultaneously learning how to become grape growers and winemakers. Their commitment, devotion and hard work paid off, today they are recognized for their quality and expressive wines. 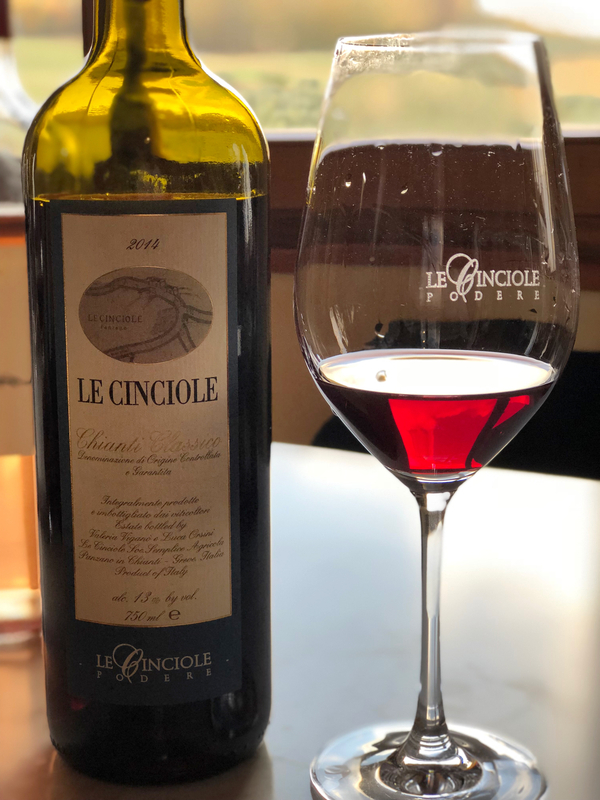 Wine Advocate has declared Le Cinciole as one of their favourite Chianti Classico estates, saying “its wines epitomize fragrant, elegant high-altitude Sangiovese…for finesse, focus, and personality these wines are hard to beat”. I was fortunate to have Valeria take me on a tour of the vineyards and cellar, along with a guided tasting of her wines. She was warm, hospitable and wonderfully patient with all of my questions. Her dedication and commitment to the land is exhilarating, and that energizing quality is one of the many characteristics reflected in their wines. The estate is certified organic and only natural and sustainable products and methods are used. 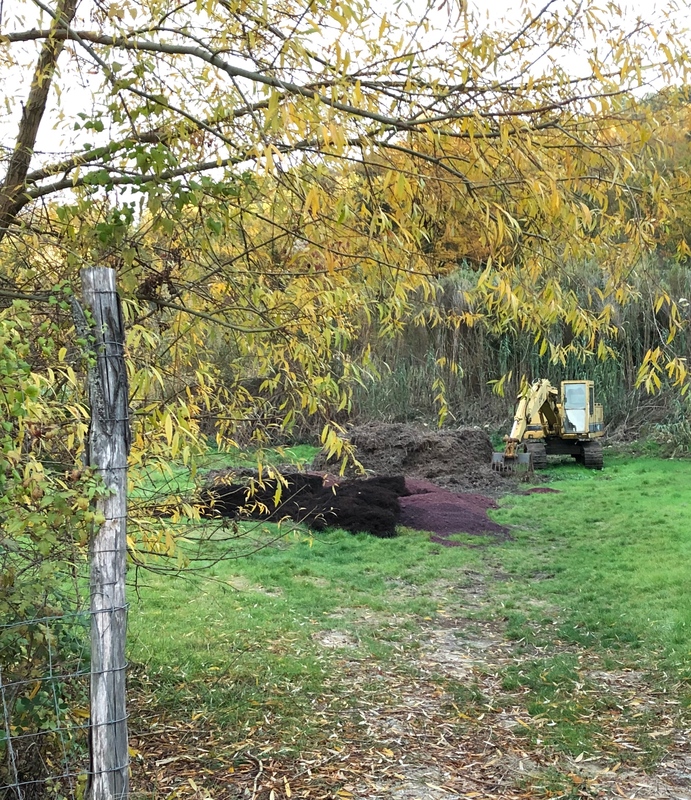 Fertilizer is obtained from composting the grape skins and the pruning bits from the vines and trees, along with manure. Wheat grass and barley are grown in between the vines. Not only do they supply nutrients to the soil, the roots help aerate, as well. With the life of the soil their focus, they also work with biodynamic preparations. Their dedication to organic farming [and Valeria’s organization efforts] prompted the surrounding vineyards who were not already following environmentally friendly practices to adapt to organic farming. Currently, 90% of the neighboring vineyards are organic. Compost pile of grape skins and pruning bits. Over the years, and particularly the past few years with unprecedented extreme weather conditions, Valeria has seen how valuable these methods are; their healthy soil and strong vines were able to stand up to the extreme heat that the area had last summer. The estate has 13 hectares of vines [9 hectares are Sangiovese vines, the remainder are Cabernet Sauvignon, Merlot, Syrah and Caniaolo], along with 5 hectares of olive groves. At 400-450 meters in elevation, their vineyards are some of the highest in the area. Their Petresco vineyard has limestone soil, the rest of the soils are the famed Chianti Classico galestro mixed with sand and chalk. Galestro, shale, clay and limestone. Only natural yeasts are used. Depending on the wine, cement tanks, eggs or large barrels are used for aging. Classical music is played in the cellar, as “it is good for people and good for wine”. Always experimenting and learning, Luca and Valeria are experimenting with crafting a wine without sulphites. The cellar: Chianti Classico 2015 barrel aging, along with one of the cement eggs. From vines in argillaceous slate and Pietraforte sandstone soils. Grapes were picked a little early to maintain low alcohol. Following a brief maceration with the skins, only the free-run must is vinified. Aged in stainless steel, bottled in the spring the year after the harvest during the waning moon. Light coral pink in colour with delicate aromas of summer ripe strawberry, a wisp of smoky earth and chalky minerality. Mineral driven, with strawberry, red currant and a hint of wild flowers. A drizzle of honey compliments the bright acidity, finishing dry and crisp. Lithe, clean and crisp, each cheerful sip disappears rather swiftly. Across Chianti Classico, 2014 was a very difficult year. At Le Cinciole they had to deal with very low temperature in the summer, along with white flies. The weather affected the grapes to such a degree that their production was significantly decreased. 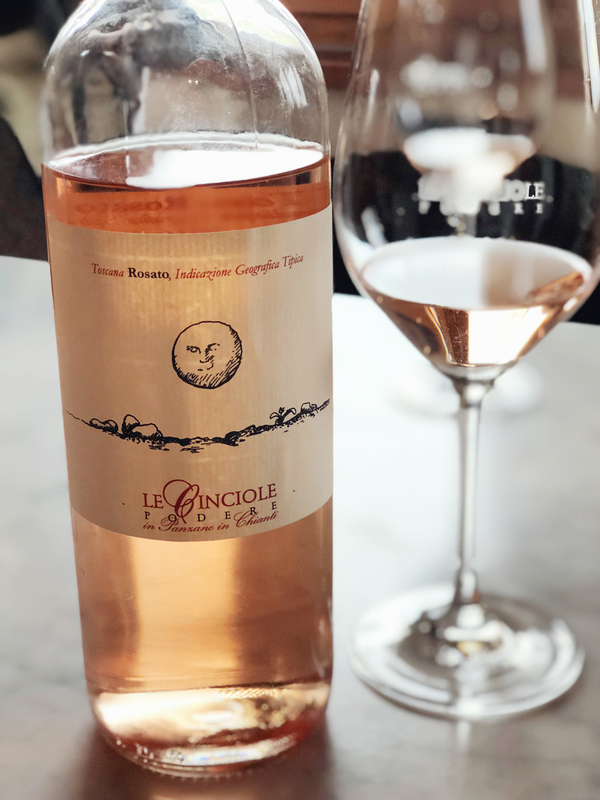 Rather than make 6 fair wines, they selected the best grapes across the vineyards, and cut their production down to only 3 wines; Rosato, Chianti Classico and Aluigi. They were unable to make olive oil at all. 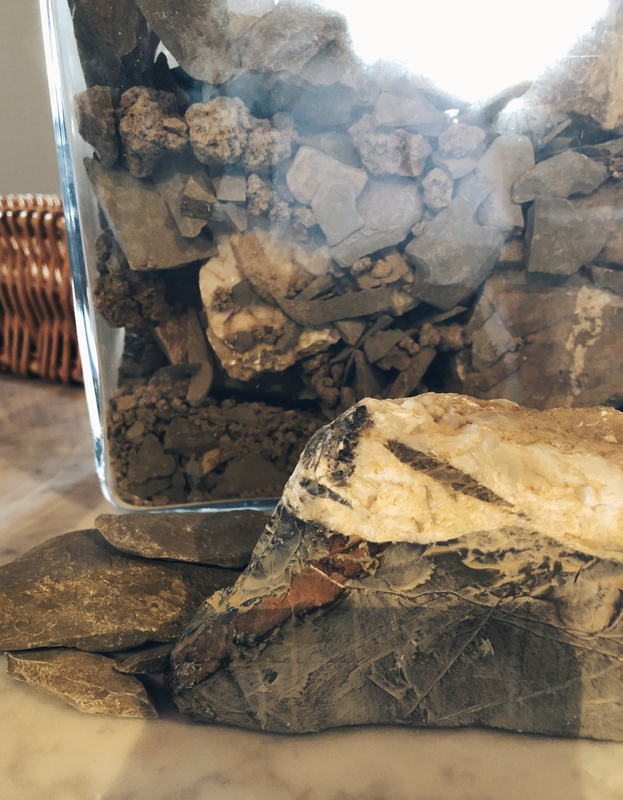 Grapes are from vineyards 450 meter in elevation, with Pietraforte, sandstone schists and clay-calcareous marly soil. Natural vinification with spontaneous fermentation in cement tanks, followed by 18 months in oak casks. Transparent ruby red in colour with aromas of candied violet, raspberry, strawberry, cherry, damp terracotta, and a shake of white pepper. Well balanced, with cherry, raspberry and earth framed by silky tannins and bright acidity. Cherry, spice and a clean, earthy minerality return on the dry, elegant finish. 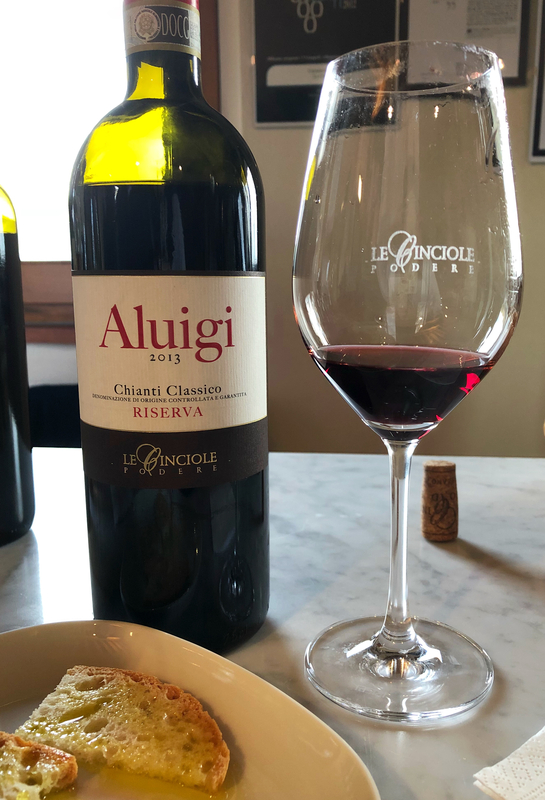 Light and agile, an easy drinking, fantastic Chianti Classico, that becomes even more remarkable in view of the challenging vintage of 2014. In honor of Valeria’s father, ‘Aluigi’ means “dedicated to Luigi”. Sangiovese grapes are carefully selected from a single vineyard. Soil is galestro clay-limestone schist over sandstone. Natural vinification with spontaneous fermentation in cement tanks, aged in big barrels for 2 years, refined in cement vats for 1 year, followed by 6 months in the bottle. Unfiltered. Brilliant ruby red in colour with delicate aromas of cherry, wild flowers, clay minerality, earth, herbs and a hint of anise. Well balanced and elegant, with layers of cherry, plum, black pepper, thyme, earth and a trace of sour cherry. Silky tannins and fresh acidity fuse into red fruits, baking spice and woodsy oak on the lengthy finish. Pure and clean, a spectacular expression of Sangiovese and the terroir of the hills of Panzano. Nero and Tigre, coming to say goodbye as we left.